Not to be confused with Alexander Pushkin. 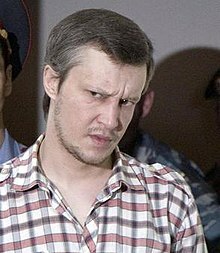 Alexander Yuryevich Pichushkin (Russian: Алекса́ндр Ю́рьевич Пичу́шкин, born 9 April 1974), also known as The Chessboard Killer and The Bitsa Park Maniac, is a Russian serial killer. He is believed to have killed at least 48 people, and possibly as many as 60, between 1992 and 2006 in southwest Moscow's Bitsa Park, where a number of the victims' bodies were found. In 2007 he was sentenced to life imprisonment. Pichushkin is remembered to have been an initially sociable child. However, this changed following an incident in which Pichushkin fell backwards off a swing, which then struck him in the forehead as it swung back. Experts speculated that this event damaged the frontal cortex of Pichushkin's brain; such damage is known to produce poor impulse regulation and a tendency towards aggression. Since Pichushkin was still a child, the damage would have been more severe, as a child's forehead provides only a fraction of the protection for the brain than an adult's. Following this accident, Pichushkin frequently became hostile and impulsive. His mother soon decided to transfer him from a mainstream school he was attending to one for children with learning disabilities. Prior to this transfer, children from the mainstream school were known to have physically and verbally bullied Pichushkin, referring to him as "that retard". This abuse served to intensify Pichushkin's rage and hostility. Upon reaching early adolescence, Pichushkin's maternal grandfather recognized that Pichushkin was highly intelligent, and felt that his innate talents were being wasted, as he wasn't involved in any activities at home, and the school he was enrolled in focused more on overcoming disability than on promoting achievement. Pichushkin's grandfather took Pichushkin to live in his home and encouraged him to pursue intellectual pursuits outside of school. The deepest of these interests was chess. Pichushkin was taught how to play, and after demonstrating his ability, was introduced to the exhibition games against elderly men who played publicly in Bitsa Park. It turned out that Pichushkin was an outstanding chess player, and, for the first time, he found a channel for his aggression when dominating the chessboard in all of his games. Pichushkin continued to be bullied by mainstream school children throughout his adolescence, and he suffered an emotional blow when, toward the end of this period, his grandfather died. Pichushkin was left to return to his mother's home, after which he enrolled as a student. According to reports, the death of his grandfather greatly affected Pichushkin. In an effort to both dull the pain of the loss as well as to calm his severe aggressive tendencies, he began to consume large quantities of vodka. He continued to play chess both at home and in the exhibition games in Bitsa Park, now joining the other men in drinking vodka, though unlike them he could play without being greatly affected by the alcohol. It was at this time that Pichushkin began to develop a more sinister hobby that, at the time, remained unknown to anyone: whenever he knew he was going to come into contact with children, he would take a video camera along and proceed to threaten them. On one disturbing and alarmingly prophetic occasion that has since been made public, he held a young child by one leg, upside down, and said to the camera: "You are in my power now... I am going to drop you from the window... and you will fall 15 meters to your death..." He then watched these videos repeatedly to reaffirm his power. However, by 1992 this practice had become insufficient to satisfy his urges. Pichushkin committed his first known murder as a student in 1992 and stepped up his crimes in 2001. Russian media has speculated that Pichushkin was motivated, in part, by a macabre competition with another notorious Russian serial killer, Andrei Chikatilo, the 'Rostov Ripper', who was convicted in 1992 of killing 53 children and young women over a 12-year period. Pichushkin has said his aim was to kill 64 people, the number of squares on a chessboard. He later recanted this statement, saying that he would have continued killing indefinitely had he not been stopped. Pichushkin targeted primarily elderly homeless men by luring them with the offer of free vodka. After drinking with them, he would kill them with repeated blows to the head with a hammer. In what became his trademark, or signature, he would then push a vodka bottle into the gaping wound in their skulls. He also targeted younger men, children and women. He would always attack from behind in order to take the victim by surprise and to avoid spilling blood on his clothes. He claimed that while killing people he felt like God as he decided whether his victims should live or die. "In all cases I killed for only one reason. I killed in order to live, because when you kill, you want to live," he once said. "For me, life without murder is like life without food for you. I felt like the father of all these people, since it was me who opened the door for them to another world." Experts at the Serbsky Institute, Russia's main psychiatric clinic, have found Pichushkin sane, but suffering from antisocial personality disorder and narcissistic personality disorder. According to the documentary, "Serial Killers", Pichushkin, once apprehended, led police officers to the scenes of many of his crimes in Bitsa Park, and demonstrated a keen recollection of how the murders were committed. He was filmed reenacting them in great detail, a process which is a regular part of Russian criminal investigation. He also revealed that some of the murders he committed were not done using his preferred method (hammer blows to the back of the head), but by throwing his victims down into the network of sewers running underneath Bitsa Park (although one of his victims did survive this ordeal). The murder of Marina Moskalyova, 36, in the spring of 2006, was his last. When her body was found in Bitsa Park, complete with Pichushkin's trademark injuries, a metro ticket found in her possession led authorities to review surveillance tape footage from the Moscow metro system, where she was filmed, just hours before her death, walking on the platform accompanied by Pichushkin. He was arrested on 16 June 2006, and convicted on 24 October 2007 of 49 murders and 3 attempted murders. He asked a Russian court to add an additional 11 victims to his body count, bringing his claimed death toll to 60, and 3 surviving victims. During his trial, as with Andrei Chikatilo, Pichushkin was housed in a glass cage for his own protection. It took Judge Vladimir Usov an hour to read the verdict: life in prison with the first 15 years to be spent in solitary confinement. ^ "Russian chess player on trial for 49 alleged murders". News.com.au. Agence France-Presse. 2007-09-14. Archived from the original on 2009-07-04. Retrieved 2009-04-10. ^ "'Chessboard killer' revels in death". CNN. Associated Press. 2007-10-09. Archived from the original on 2007-12-15. Retrieved 2009-04-10. ^ "Investigators believe 62 murdered by "chessboard killer"". RIA Novosti. 2007-08-01. Archived from the original on 28 April 2009. Retrieved 2009-04-10. ^ "Russian suspected of 62 murders". BBC News Online. 2007-08-01. Retrieved 2009-04-10. ^ "Russia 'chessboard killer' guilty". BBC News Online. 2007-10-24. Archived from the original on 25 April 2009. Retrieved 2009-04-10. ^ "Serial Killer in Moscow killed 52 people". Dailymotion. Russia Today. 2007-11-12. Retrieved 2009-04-10. ^ Chua-Eoan, Howard (2007-09-12). "The Grandmaster of Murder?". Time. Retrieved 2009-04-10. ^ "Serial Killers". TV Shows. WIN TV. 19 May 2010. Archived from the original on 19 May 2010. Retrieved 29 August 2017. ^ "Chinese drifter among 7 of the world's worst serial killers". South China Morning Post. 2018-10-28. Retrieved 2018-10-28. ^ "Serial killer on trial: Moscow's grandmaster of murder". The Independent. London. 2007-09-14. ^ a b Bukharbayeva, Bagila (2007-10-24). "Russian Convicted of 48 Murders". Chicago Tribune. derkeiler.com. AP. Retrieved 2016-04-02. ^ Sweeney, Conor (2007-10-09). "Russian serial killer says murder is like love". Reuters. Retrieved 2009-04-10. ^ Lowe, Christian (2007-10-24). "Russian 'chessboard killer' convicted of 48 murders". Reuters. Retrieved 2009-04-10. This page was last edited on 1 April 2019, at 20:09 (UTC).